Our charitable roots began in 1875 with a small group of 24 Manchester area women who banded together to serve the needs of the greater community. They sought inclusivity – any woman could join the work of the Society for an annual fee of 50 cents. The Women’s Aid and Relief Society had a strong impact on the mill town of their day and effected positive change in hundreds of lives. 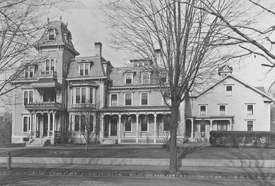 Their work evolved as the community did, remaining committed to housing and nursing needs, and transforming their buildings and services to match; from opening the area’s first hospital, to creating Pearl Manor. In order to provide multiple levels of care, in 1995 Pearl Manor moved from its original location to join Hillcrest Terrace on its new campus. In 2009, that entity became Manchester’s first Continuing Care Retirement Community (CCRC) and changed their name to Birch Hill Terrace, now Birch Hill. The legacy of their work continues to evolve and grow to this day. The Pearl Manor Fund was established by probate court order in 2005 when approximately $5M of Women’s Aid Home’s (D/B/A/ Pearl Manor) assets were transferred to the Mary & John Elliot Charitable Foundation (the “Funds”). Earnings on the funds are distributed through annual grants to not for profits for the specific purpose of providing assistance, comfort, care and treatment for the elderly population of Manchester and surrounding communities, including, but not limited to, medical needs, safe housing needs, nutritional needs, legal needs, independent living assistance and transportation assistance. The grants are made by a group of community volunteers, the Pearl Manor Fund Advisory Committee and are to be distributed in accordance with the original intent of Pearl Manor. Please follow this link to the column to learn more about the history and impact of the Pearl Manor Fund. FIELD OF INTEREST: The Pearl Manor Fund is distributed through grants for the specific purpose of providing assistance, comfort, care and treatment for the elder population to include, but not limited to, the needs surrounding medical care, safe housing, nutrition, independent living and transportation assistance. AREA SERVED: The Pearl Manor Fund supports the efforts that benefit the elder residents of the Greater Manchester area. The area specifically includes the towns of Allenstown, Auburn, Bedford, Candia, Deerfield, Dunbarton, Goffstown, Hooksett, Manchester and New Boston. GRANT PROGRAM: Grants are awarded on an annual basis (when funds are available) to support new or expanding projects/programs that implement solutions and address the critical and unmet needs of the elder community. Grants are typically made in the $10,000- $25,000 range, although applications for grants for highly-collaborative and impactful programs at higher levels will be considered. Involve collaboration with other agencies, when possible. Please click here for the Pearl Manor Fund grant application, deadline information and application materials. Please find complete and detailed information about the grant process in the application kit, along with contact information for questions.